Dinosaurs are a big deal out our house...with three boys I know you are shocked! 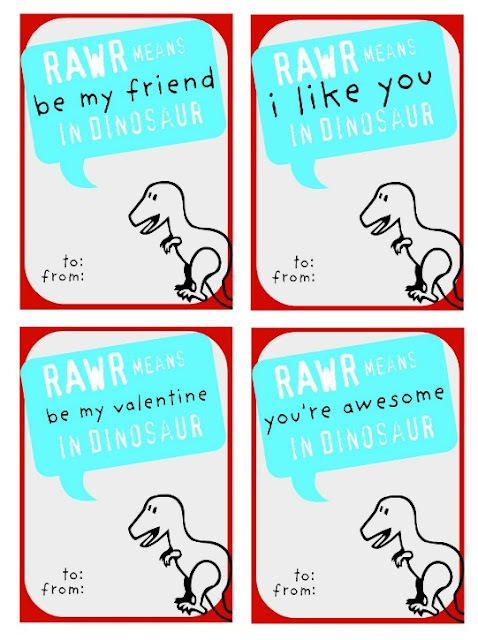 So this year I decided to make dinosaurs a part of Valentine's Day. I found these adorable teeny tiny dinosaurs at The Mart (refresher...this is how I refer to Walmart) in the party favor aisle. Around the same time I saw a pin for THIS. Combine both and I came up with an idea for my own Valentines. I found out RAWR pretty much covers it all. Whew...good to know. Then I went into Picnik and made up some of my own cards using all of their free editing tools. On a side note...anyone else devastated that they are closing up shop? I am starting to have a mini panic attack about it all. Supposedly they are moving everything to Google+, but I am a little leery that it is going to work the same. Maybe I will be surprised. Okay, sorry for the side rant. Back to the cards. These are the cards I made. Please feel free to click on picture and save to your computer. I cut up sammie bags and sewed them into smaller bags. I dropped one of the teeny tiny dinos inside each bag and then sewed the bag to the bottom of the card. I think they are super stinkin' cute. Twenty-four cards later I was frazzled, but their cuteness rating remained high. Now Oldest is ready for his school Valentine's party. All he has to do is sign his name. these are great!! Pefect for my little boy for school. These are VERY VERY CUTE!!!!! My son is going to love these! He is really into dinosaurs right now. Thank you! My son and I already purchased mini dinos for his valentines to hand out and I've been trying to figure out when/how to make the tags. This is perfect! These are adorable! I love that it's an alternative to candy,and the sewn bags are too cute. Thumbs up from Ohio! Thanks guys!!! Glad you like them. This is such a great idea - especially since the schools won't allow candy anymore! Thanks for sharing! Larissa, this is SO cute!! 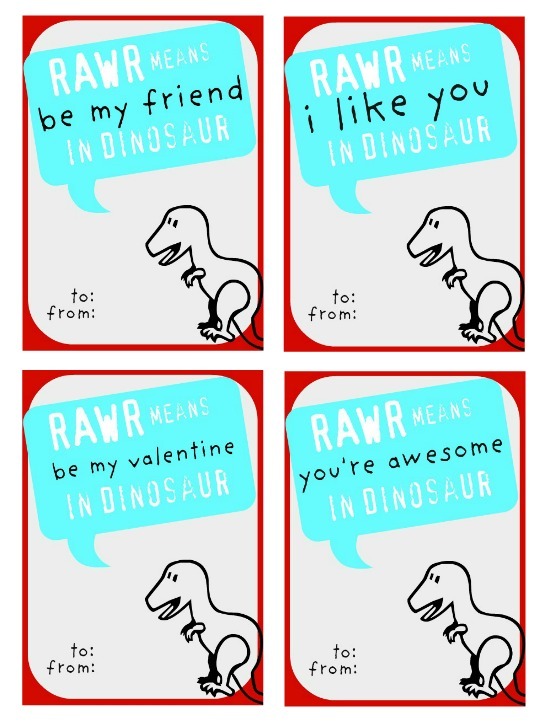 So perfect for a little boy's valentines!! Thanks for sharing at oopsey daisy!